Wow, what a storm this weekend! I drove to NJ to experience the nor’easter first-hand and wasn’t disappointed after years of “missing out”. I know, many of you would rather not deal with these storms, but these storms are the reason I became a meteorologist. The drive started with a mix of rain and snow in Baltimore and continued that way all the way to Cherry Hill, NJ where the snow dominated at 9:30 a.m. Snowflakes were 1″-2″ across, more like mini snowballs. The snow lasted until about 4 miles east of Medford, NJ where the temperature in the Pine Barrens rose over 40 degrees. One thing I noticed was the relative lack of wind inland, even up to 12 miles from the shore, the wind looked to be only in the 15-20 mph range. When I got to Toms River, the wind rose dramatically and I found an unofficial gust to 54 mph in Ocean Gate. I drove to the oceanfront with Mom where we saw an angry ocean, but no coastal flooding. I was also quite impressed with the 3′-4′ waves in the Barnegat Bay. By 6:30 p.m., the rain had changed to snow in Toms River where I observed a dusting and icy windshield by morning. This was a rather typical nor’easter for the Jersey Shore, but further inland, it turned into a blockbuster snow event. . .and with leaves on the trees!!!! The October 29-30 total snowfall map from the Mt. Holly, NJ NWS office. 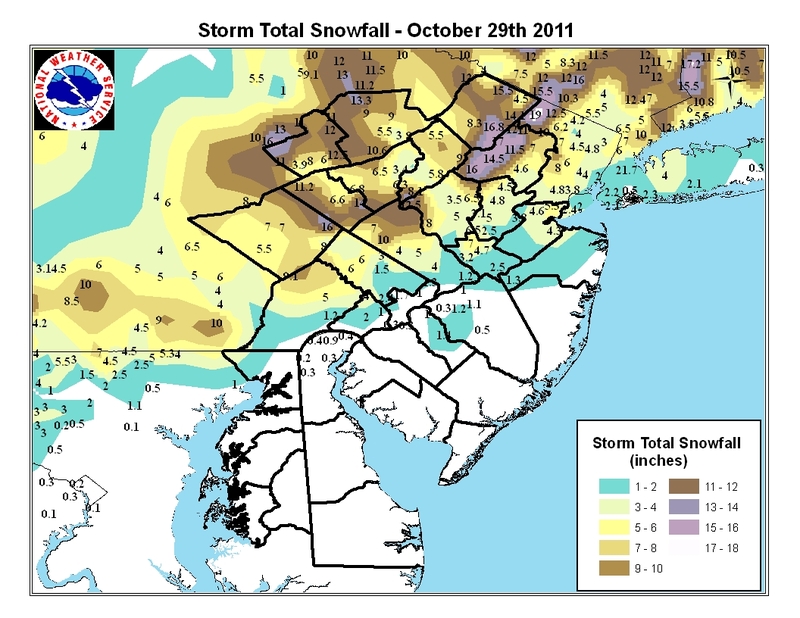 The above map shows the total snowfall totals from the now dubbed “Snowtober” storm in some circles. What made this storm so interesting is the sharp gradient and relative higher amounts of snow from NYC down through Middlesex County, NJ. Snow amounts topped off at 31.4″ in NH and the highest wind gust reported was 69 mph in coastal MA. Over 3 million were without power during the height of the storm due to the heavy snow on leaved trees, not necessarily the wind. Many will continue to be without power through the week. The irony is that this area was also heavily damaged by Hurricane Irene in August. The above image is the Southern Oscillation Index (SOI) which I compiled with data collected from the Australian Weather Bureau. 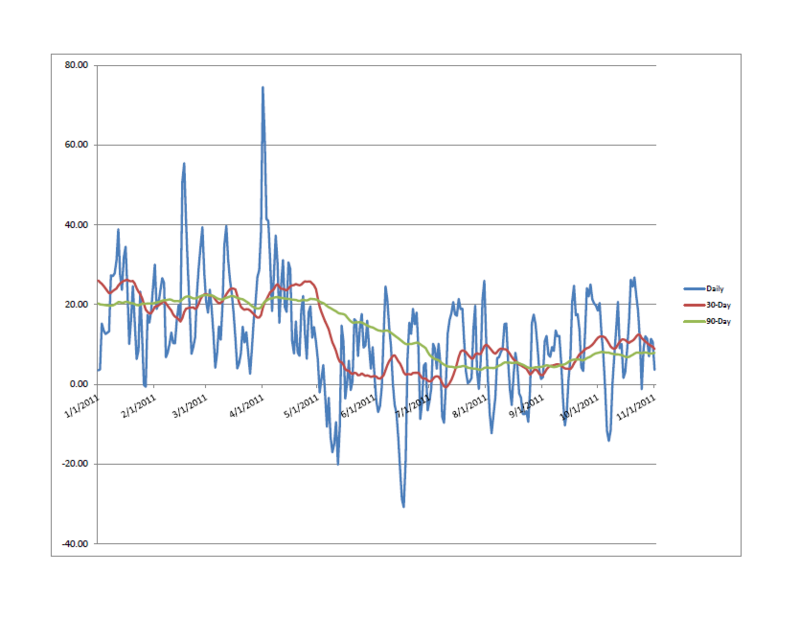 This is one of a few tools used to describe the state of the El Nino Southern Oscillation (ENSO). When the SOI is positive as it has been through the year, La Nina conditions are the result atmospherically. The more positive the number, the less effect you get from the subtropical jetstream and hence the drought conditions experienced from TX through FL. The tropical Eastern Pacific is still cool and it looks as though La Nina conditions will be experienced at least through the beginning of winter. Does this mean more blockbuster snowstorms for the East Coast? More drought for TX, LA and down through FL? Will there be another hurricane before the season officially ends on 11/30? I will try to answer these questions during the next week as the weather takes a break on the East Coast. Kind of strange this storm hit just days I asked you about the NAO. I was up in Berkeley Heights today … tree limbs are everywhere. It’s hard to spot a tree that didn’t lose some branches.